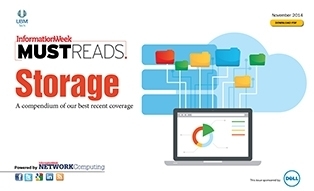 Network Computing's November Must Reads is a compendium of our best recent coverage of storage. In this issue, you'll learn why storage arrays are shrinking for the better, discover the ways in which the storage industry is evolving towards 3D flash, find out how to choose a vendor wisely for cloud-based disaster recovery, and more. Yes, I agree to receive electronic messages from Dell and Dell Financial Services, including information about products, services, solutions, offers and deals. You may withdraw your consent at any time. Please visit Dell's Privacy Statement for additional information or Contact Us for further inquiries.